Flu and the common cold are both respiratory illnesses but they are caused by different viruses. Because these two types of illnesses have similar symptoms, it can be difficult to tell the difference between them based on symptoms alone. In general, flu is worse than the common cold, and symptoms are more common and intense. 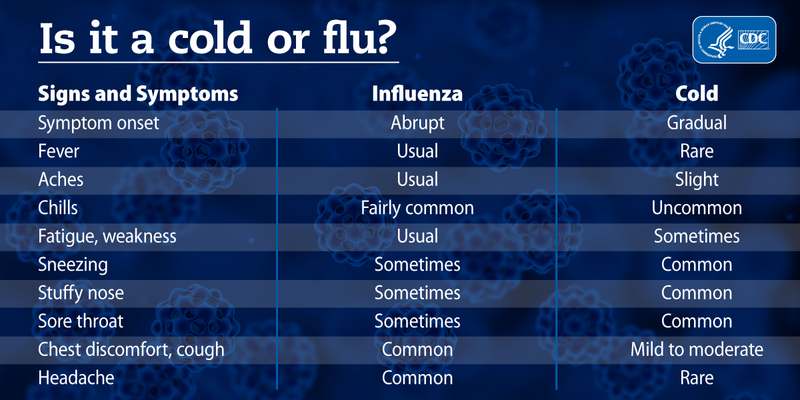 Colds are usually milder than flu. People with colds are more likely to have a runny or stuffy nose. Colds generally do not result in serious health problems, such as pneumonia, bacterial infections, or hospitalizations. Flu can have very serious associated complications.